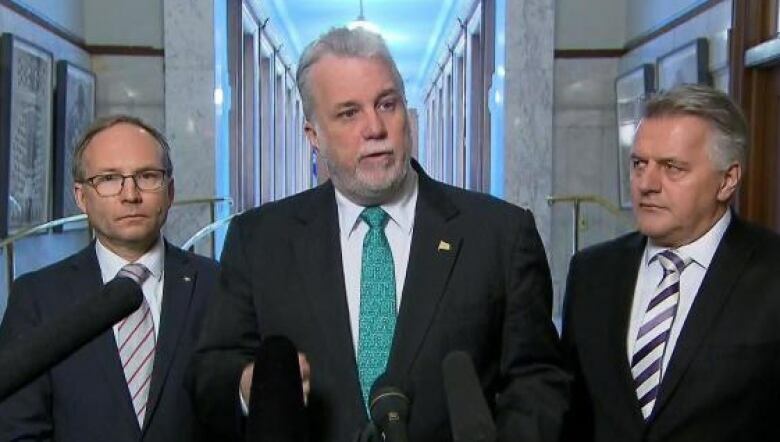 Quebec Premier Philippe Couillard has announced an independent review into the government's handling of this week's snowstorm, after more than 300 people were stuck on Highway 13 in Montreal overnight. Couillard stood by his cabinet colleagues as the political opposition called for heads to roll. However, an assistant deputy minister has been shuffled out of her job in the Transport Ministry and the Sûreté du Québec officer in charge of the Highway 13 situation is now on administrative leave. More than 300 people were stuck on the highway for nearly 12 hours as the snowstorm raged on. At a news conference, Couillard apologized on behalf of the government for its poor response. "I wasn't happy yesterday, I'm actually even less happy today," he said Thursday, standing alongside Transport Minister Laurent Lessard and Public Safety Minister Martin Coiteux. "I see serious shortcomings in how people worked together." The premier appointed Florent Gagné, a former deputy minister, to lead the investigation, which will focus on the timeline of events and how authorities communicated with one another. The report will be made public. The announcement came after both the Parti Québécois and Coalition Avenir Québec said Lessard should step down over his handling of the file. They argued the province didn't act quickly enough following an accident involving a tractor-trailer that blocked traffic at 6 p.m. Tuesday, as commuters made their way home in the blizzard. "More than 100 times, the SQ called the Transport Ministry," CAQ Leader François Legault said deploringly. Police and firefighters only started to help free the vehicles at 4:30 a.m. Wednesday. By the time traffic was moving freely once again, more than 12 hours had passed. Marcy McCallum, who was stuck on the highway for nine hours, said she felt "completely forgotten about." "It wasn't until my ninth hour of being there that a police officer knocked on the window and advised me they were creating a route out," she said Thursday, when asked for her thoughts about the political fallout. "I hope that this does not turn into a long drawn-out investigation, because to me it's pretty clear communication was an issue — I think stemming from the correspondence of 911. But there's also the issue of being so unprepared. I believe that needs to be looked into." The premier had acknowledged on Wednesday that the province "lacked co-ordination" in its response. On Thursday, though, he said there needs to be "consequences." However, he said he has no plans to fire Lessard over the confusion between emergency response services and bureaucrats that left drivers stranded. "Both my colleagues were not informed of anything until the next morning," Couillard said. When asked why police weren't even dispatched to hand out bottled water and granola bars to stranded drivers, Couillard said that's "all part of what should be investigated." The province is also investigating whether Roxboro, the private company hired to clear the road, fulfilled its contract. If not, the contract will be cancelled, Lessard said. Roxboro did not return a request for comment Thursday. The union representing Transports Québec employees, meanwhile, said the ministry should have brought in extra workers. Lessard has already taken one concrete step: The assistant deputy minister of transport, Anne-Marie Leclerc, has been stripped of her responsibility for civil security. He said help should have arrived for the trapped motorists much earlier. "By all accounts, by the time it was after 10 p.m., all indicators were flashing red that it was time to launch civil security procedures," Lessard said. Leclerc will retain her parallel position as assistant deputy minister responsible for infrastructure and technology, however. At a separate news conference, Sûreté du Québec Capt. Guy Lapointe said police should have made the decision to evacuate the highway earlier. He said the officer in charge of the situation has been placed on administrative leave pending the investigation. Lapointe also tried to explain why it was so difficult for police to get traffic moving. Two trucks were involved in the accident that created the blockage near the Hickmore Street exit of Highway 13 shortly after 6 p.m., he said. One of the trucks had jackknifed across the southbound lanes, leaving no way for traffic behind it to pass — and leaving police unable to get to the scene immediately. Lapointe said the truck drivers did not co-operate when authorities tried to tow their vehicles, and they could face criminal charges. "An investigation is ongoing, in the sense that they did not respect the work of police," he said. A class action lawsuit was filed against the government on Thursday afternoon. The lawsuit names the provincial police, the transport ministry and Montreal's civil security. Victims are asking for $2,000 each plus material damage. What went wrong on Highway 13, where at least 300 were stranded overnight?